What do you wear to visit the past? So let's say you are planning a little trip to the past. Naturally, the first thing you consider is: What to wear? Well, Topatoco has just the thing! 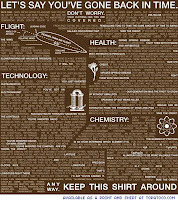 "This shirt has how-to information on all of the low-hanging fruit of our modern age. Go back in time wearing this and you'll invent heavier-than-air flight! YOU'LL discover penicillin. YOU'LL be the first to isolate aluminum. Did you know aluminum used to be more valuable than gold? YOU'RE GONNA BE RICH." Click the image to see the text in detail. I guess the real question is: what if you suddenly travel back in time? Should you keep this t-shirt with you at all times? Should you wear it every day? Maybe keep a fresh one in your bag at all times? Hmm, tricky.